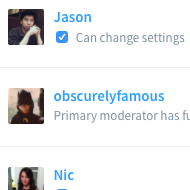 Create and enforce moderation rules in your community with Disqus tools. Set the tone of your community and remind readers about the rules for commenting on your site. Enlist the help of your community to report abusive content by flagging comments. 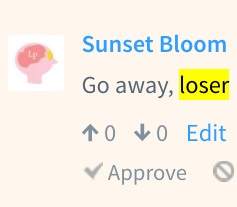 If comment quality is a concern, you can turn on Pre-moderation for some types (e.g. comments containing links) or all comments. This sends comments to Pending and will only be published once a moderator has approved it. 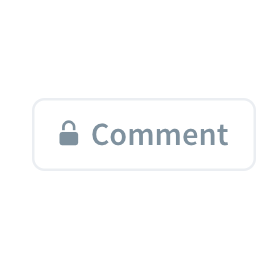 It might make sense to automatically close discussions after a set period of time, especially if moderating comments on older posts takes too much time. Generally, we recommended closing threads after 14 or 30 days. Any time a comment or name contains a word you've specified in this filter, it will automatically be flagged for moderation review before it can be published. You can use the default sample list provided or customize with your own words. You can’t just add comments and expect a community to emerge. Active moderators are essential to cultivating a healthy environment for diverse opinions. Add members from your team or recruit readers from your community to help moderate discussions.